Our exclusive Apple Pest Trap will protect your apples, pears and other fruit crops and ornamentals from damage caused by the voracious appetites of codling moths and Oriental fruit moths. The adults already cause trouble, but the insect larvae are damaging, too, since they can cause severe losses to fruit crops. Control is complicated, because these pests produce multiple generations each year. 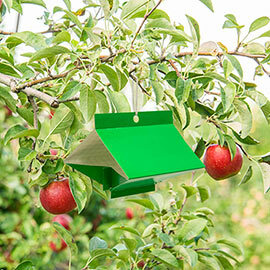 However, our Apple Pest Trap uses powerful pheromones to lure the insects inside where a pre-coated sticky surface traps them. 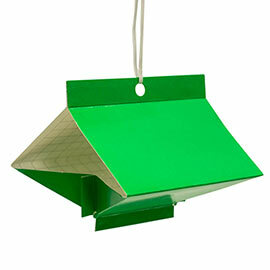 Traps are made from waxed heavy-duty cardboard designed to last one season. When the season is over, simply discard them—no mess and no cleanup. For best results, set out traps in early spring at least 2 weeks before buds emerge. Use two traps per mature, full-size tree, and one for dwarf trees. Replace the lure after 8 weeks. If crop damage has already begun, traps may reduce the second generation, but you may need to seek additional control methods.